Do choosy cuckoos choose well-matched hosts? « Nothing in Biology Makes Sense! Although the match between cuckoos’ eggs and those of the specific host species whose nests they invade is striking even to human eyes, it had been generally assumed that, within these egg-matching associations, cuckoos could choose nests pretty much at random. That is to say, while the differences in coloration and spotting between the eggs of different host species were enough to make it hard for a cuckoo egg to blend in with the nests of redstarts and warblers at the same time, a cuckoo whose eggs match the eggs of one redstart will also match the eggs of most other redstarts. Cuckoo eggs (indicated by arrows) in the nests of three different host species. A 2006 study suggested this thinking might be wrong. A group of European ornithologists took advantage of a handy “natural experiment” on the Dutch island of Zealand, where cuckoos had been absent until the early twentieth century. Using museum specimens of cuckoo eggs and eggs from the reed warbler nests in which they were collected, the team compared the match between cuckoo egg color and host egg color over time. Improved matching could be due to female cuckoos selecting better-matched host nests in the new host population; but it could also be created by simple natural selection—the colonizing cuckoos evolving eggs that better matched the host population on average. The coauthors found evidence of rapidly improved matching—but no evidence that the cuckoo’s egg color had changed overall. It looked like the newly arrived brood parasites were adapting by learning, or by evolving, preference for better matches. Some of the same ornithologists followed this result with a small 2007 study that more directly examined the role of host choice by cuckoos. At a field site in Hungary, they measured the match between cuckoo eggs laid in the nests of great reed warblers, and compared the rate at which warbler parents ejected the naturally-laid cuckoo eggs to the rate at which they rejected randomly-drawn cuckoo eggs introduced into their nests by members of the research team. They found that, indeed, the cuckoo-laid cuckoo eggs were better matches to the eggs in their host nests than researcher-laid cuckoo eggs were—and, more importantly, warblers were less likely to reject the better-matched cuckoo-laid eggs. A great reed warbler is probably ready for this cuckoo chick to leave the nest. This result was somewhat complicated, however, by a study just published in PLoS ONE. This time the authors, again including many of the same ornithologists involved in the original 2006 study, compared the match between cuckoo eggs laid in marsh warbler nests at a site in Bulgaria to the cuckoo eggs’ potential match with warbler eggs in nearby unparasitized nests. If cuckoos were choosing the best-matched host nests, the authors reasoned, there should be a better match between cuckoo eggs and the eggs in parasitized nests than in nearby nests, which the same cuckoo could have used, but didn’t. Six years after the original cuckoo choosiness study, the team was able to use a new approach to compare the match between host and cuckoo eggs: rather than simply compare the spectrum of light reflected by the eggs, they fed the measured spectrum into a mathematical model of bird vision—an approach used in other studies of brood parasites, which is thought to be superior because it estimates how similar, or different, two eggs look through the eyes of a host parent. With this approach, the team found that cuckoo eggs were not siginificantly better matched to warbler eggs in parasitized nests than they were to eggs in nearby unparasitized nests. Did this overturn the previous evidence for choosy parasitic parents? Well, maybe. On the one hand, the new study uses the new vision model comparison method, which should give more biologically meaningful results. But on the other, the new study’s design is different in from the 2007 study in a critical way: it doesn’t tell us whether cuckoos’ host choices make the hosts less likely to reject cuckoo eggs. In the 2007 study, there was no need to guess whether the statistical comparison of egg color spectra was biologically meaningful—host parents “told” the researchers that the comparison mattered by rejecting randomly-chosen cuckoo eggs more often than they did eggs laid by actual cuckoos. So, although there are good reasons to think that the form of measurement used in the new study is better, it’s not clear to me that the result is actually more useful for understanding how natural selection could be acting on cuckoos choosing among many available host nests in a single population. What I’d like to see is a study using the field methods of the 2006 study, and the color matching methods of the 2012 one. This entry was posted in coevolution, natural selection, parasitism and tagged brood parasite, common cuckoo, cuculus canorus, host selection, ornithology. 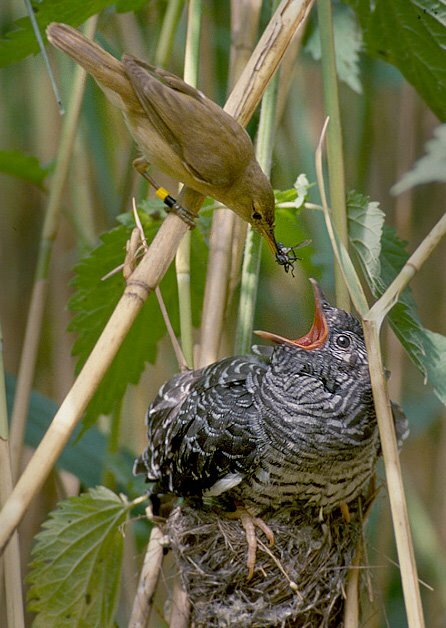 How much does the cuckoo’s access to the parasitized nest affect its nest choice? If the cuckoo has a small window of time when it’s about to lay and requires the nesting birds to be away from the nest, then I can imagine that holding out for an optimal color match could be less adaptive. Good question! Knowing nothing about the behavioral ecology of the three different host species involved, I’d assume they all provide about the same amount of opportunity to sneak in and “donate” an egg. 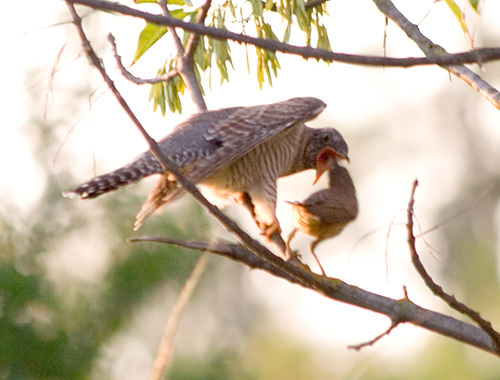 But it makes sense that a more watchful host species would force female cuckoos to do the deed a little faster, leaving less time to evaluate the match.